and a great place for the cat to hide in? 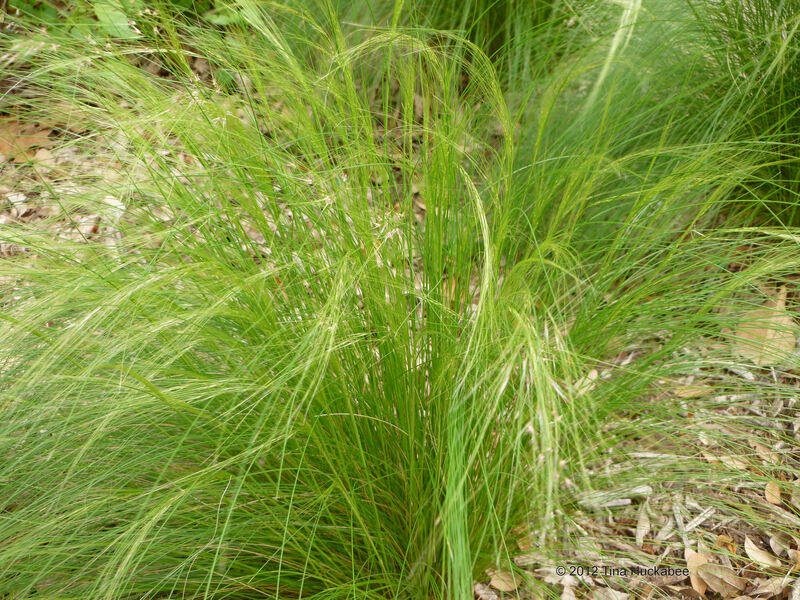 Mexican Feather Grass (Nassella tenuissima)! 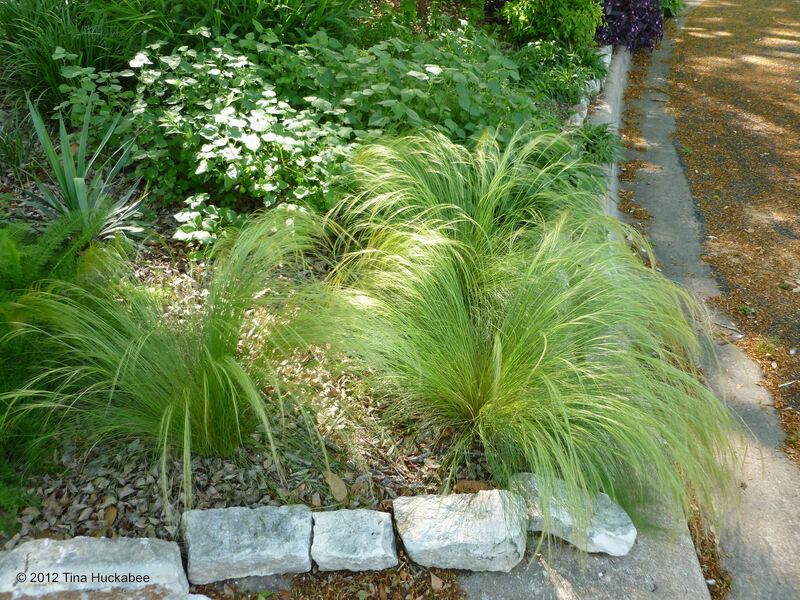 Today is Foliage Follow-Up, hosted by Pam at Digging and my foliage plant-of-choice for today is an ornamental grass which is a beautiful addition to the perennial garden. it’s xeric even though it looks delicate and beautiful. it is a plant that can take some shade. These two new ones receive only dappled light and I expect that they’ll grow well. 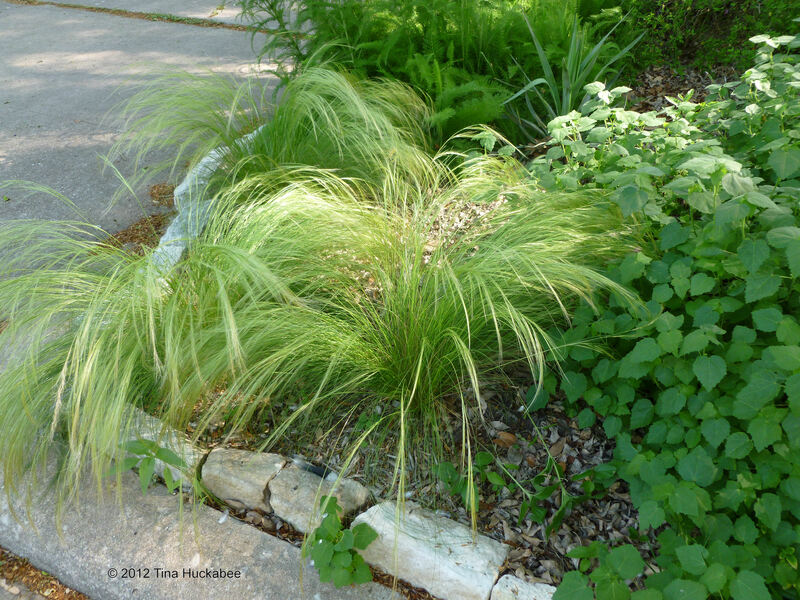 I’ve seen Mexican Feather Grass in a in a variety of places as an understory ground cover and it works nicely. and what they look like now. 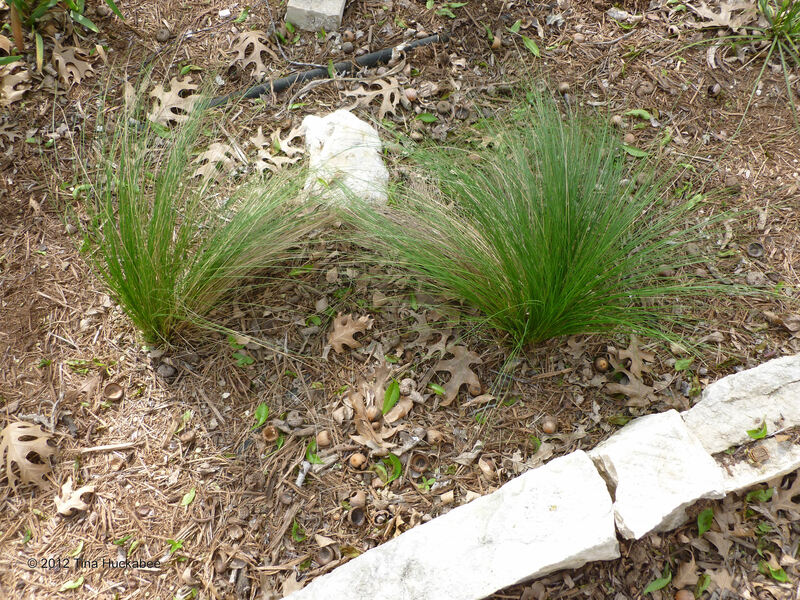 The Mexican Feather grass normally blooms in late spring/summer, but mine have started a bit early this year (like so many other plants). These plants will seed out, though I’ve never had many seedlings develop–until recently. I was weeding one of my beds and discovered about 20 seedlings!! There are others elsewhere in my gardens, too. Wow! I’ll give them to my friends! I’ll give them to my enemies! I’ll buy a new house with a bigger lot and plant them there! Well, maybe for now, I’ll just enjoy the ones that I have planted in the gardens. 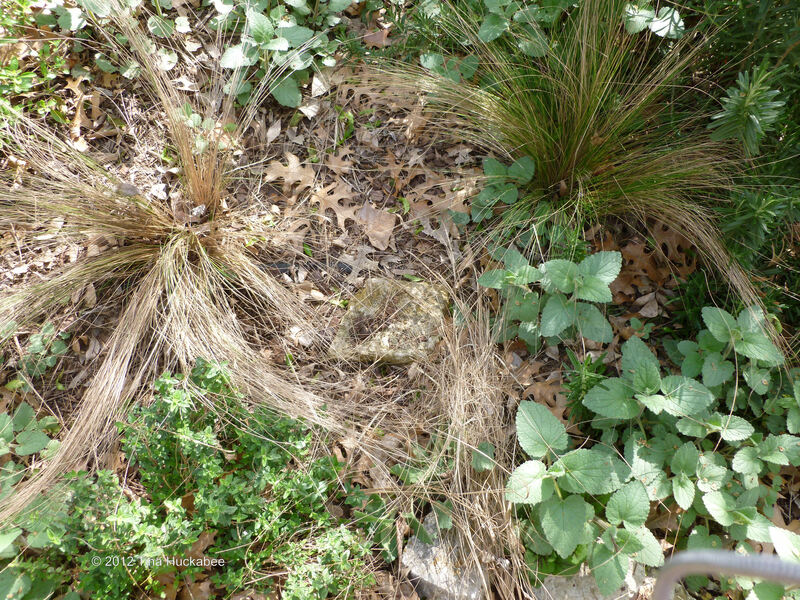 Many people (myself included…) have made the mistake of pruning these lovely plants like other ornamental grasses are pruned, that is to say, snipped straight across, close to the ground. Don’t do that!! It takes forever for them to grow out and they just look stupid for a long time. 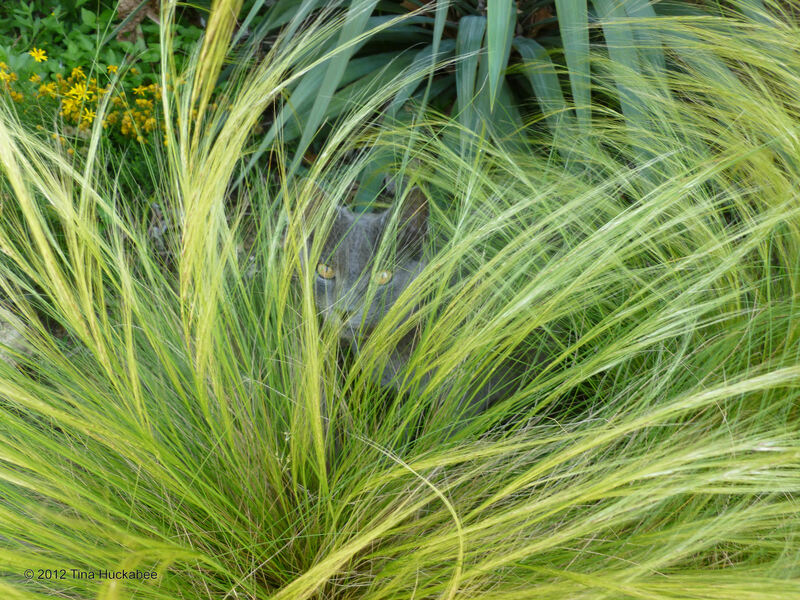 The best thing to do when you notice that the Feather Grass seems to have more brown than green, is to gently run your hands through the plant and pull out the “dead” strands. They’ll come loose easily and this combing should leave your plant with green, healthy strands. I’ve done this at various times of the year, as needed. What I’ve also found over time in my gardens is that sometimes Feather Grass rots out, especially if planted in heavy, clay soil. The two above have been in the ground for 5-6 years and I believe the one on the left is declining. Is it the soil? Maybe, although the one to the right still looks good and has new, fresh growth. If you want this plant, I wouldn’t hesitate to plant in heavy soil-just be aware that it might not be a long-lived perennial. 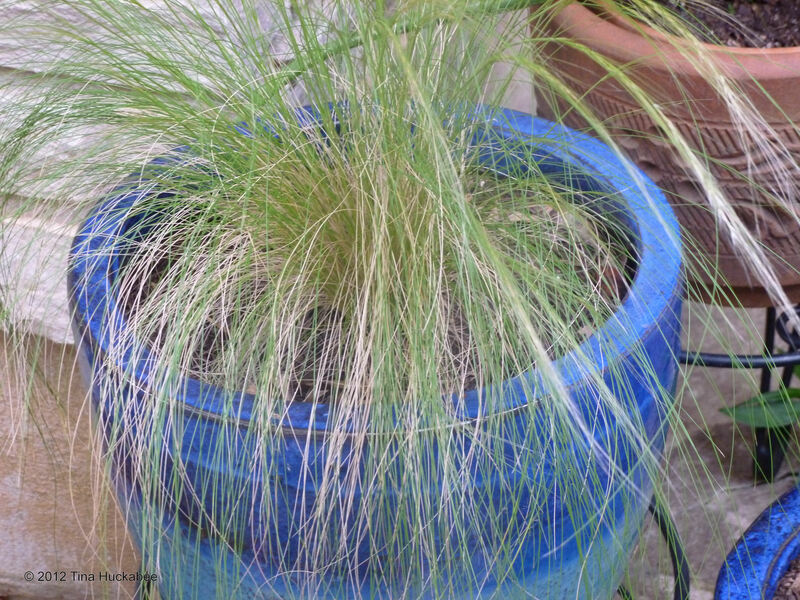 Mexican Feather Grass also makes a great container plant, as well. It will need some supplemental water, but doesn’t require constant watering. 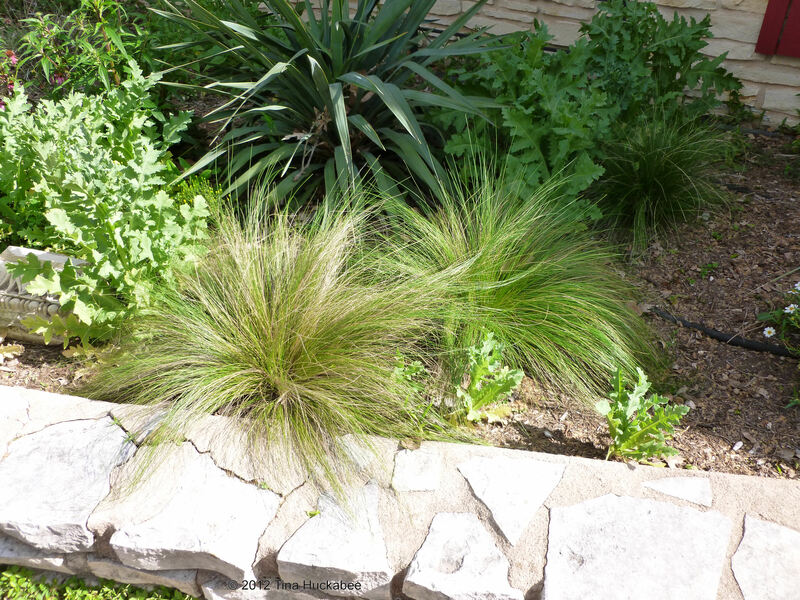 or mix with spiky, more architectural plants. it’s also great for silly, metal birds, too. 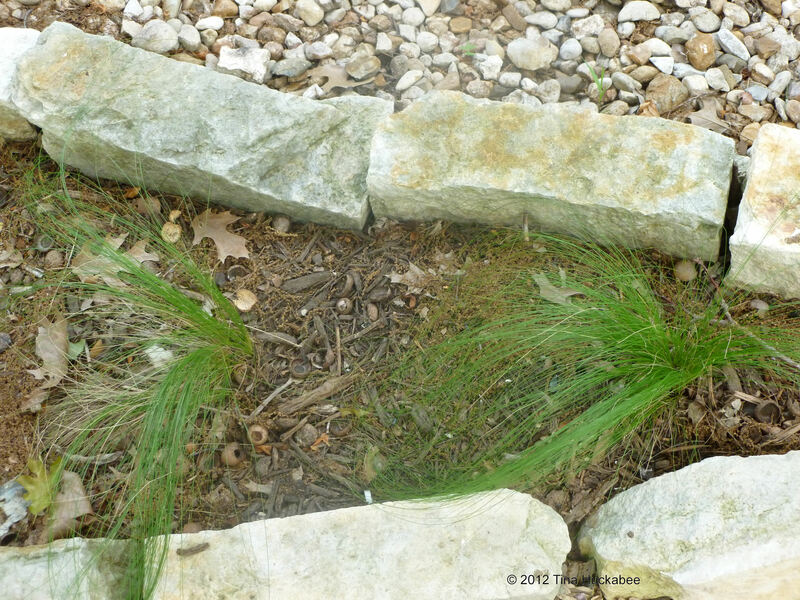 This entry was posted in Mexican Feather Grass, Nassella tenuissima, Xeric plants by Tina. Bookmark the permalink. Most of my feather grass is in sandy soil, and I’ve had some die off occasssionally. No worries, though. 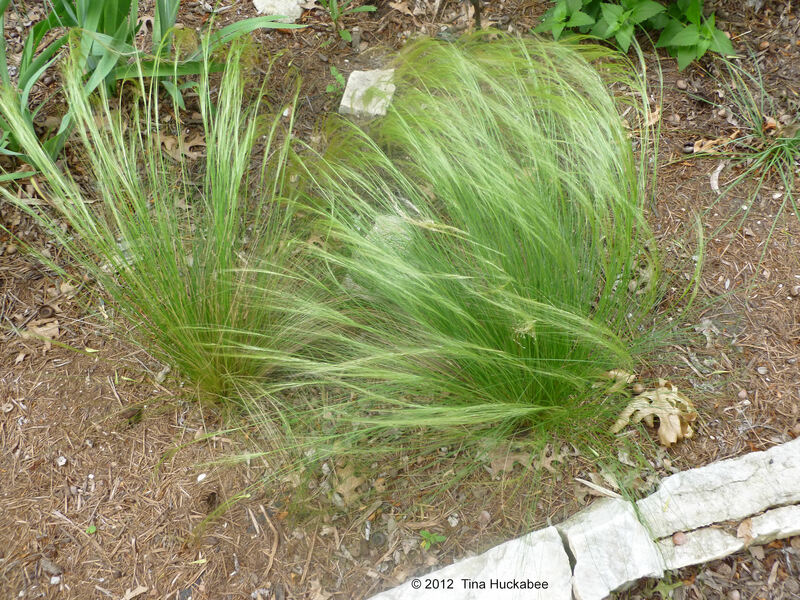 Feather grass is a prolific re-seeder, so I can always find a baby plant to fill in the empty space. Ally, I’m tickled to have so many seedlings this year–a first for me. But Feather Grass is so versatile, I doubt I’ll have much trouble finding homes for them all! I’m a fan of feather grass too. Cute pictures of the peeking kitty. A friend is considering feather grass for a large area, but wondered if her large, active dog would be too hard on it. Have you noticed any issues with yours? luscious as others that he has no contact with. That group is also in shade, so that might be a consideration as well. 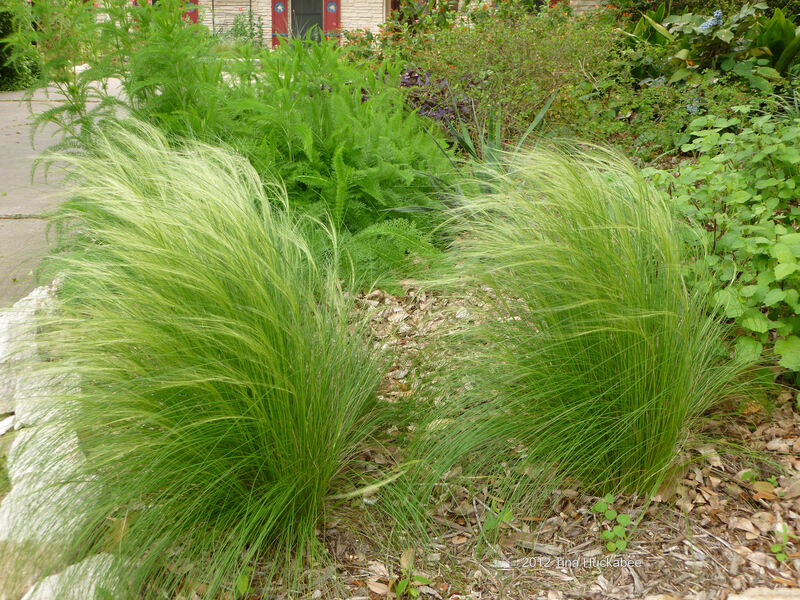 Feather Grass is so pretty though in a large area–I’d try it anyway. Thank you Tina, I’m trying to talk them out of putting Ivy on their slight slope as recommended by the landscape company. Yuck! You’re welcome. I agree with your “yuck” statement via-a-vis ivy. 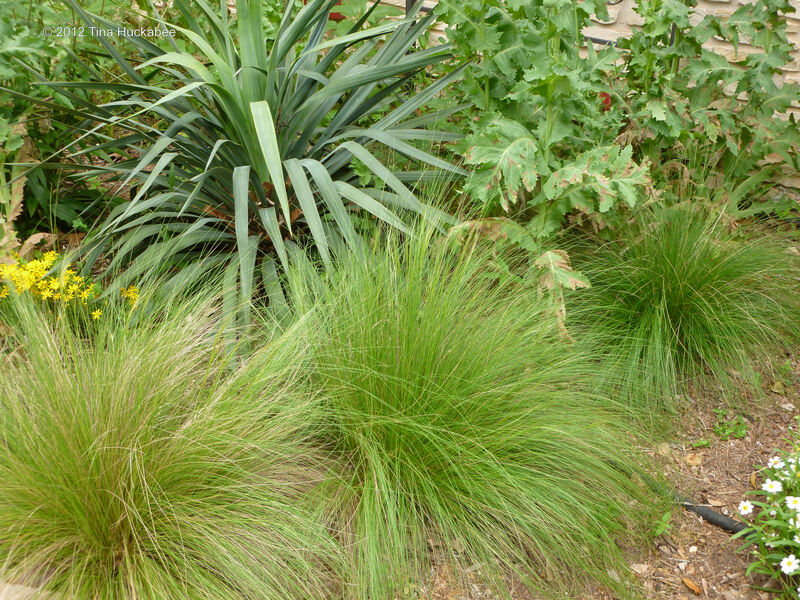 Have you suggested to them either the Berkeley Sedge (Carex divulsa) or even better, the Texas sedge (Carex texensis)–I’ll bet either one of those (although maybe not quite as lovely as the Feather Grass), would work well. I know that in California the Berkeley is considered an invasive and that it certainly it is a prolific seeder here, I just don’t know that anyone considers it a problem plant at this point. I hope your friends do something besides ivy, though. 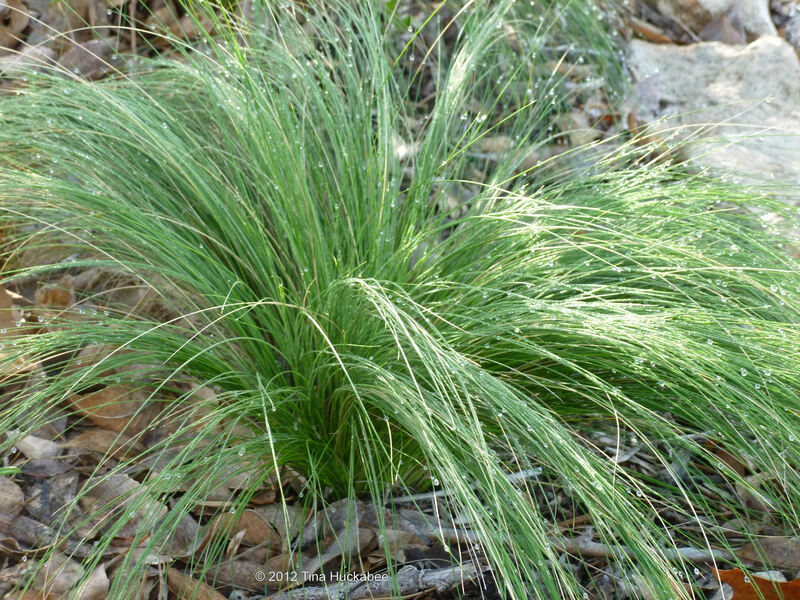 I love Mexican Feathergrass. And, like you, I haven’t had many ‘babies’, until this year. I’ve been moving them all around. Some have made it, others haven’t. But, there are more where they came from. It was wonderful last summer here, with only a once a month watering. And, deer don’t eat it. Linda, that’s good to know about the deer–I forgot to check about that. I’m lucky, I don’t have deer to contend with. And you’re so right about the drought tolerance of Feather Grass–it’s just so great for our summers (and other dry times too!). Tina I would love to run my hands through that grass as it looks so tactile. 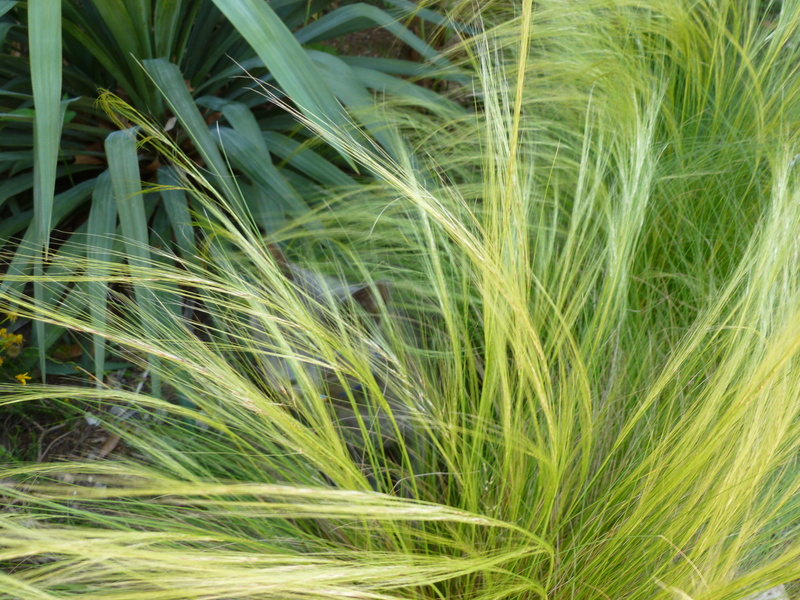 I don’t think that would be hardy with me in Scotland but I grow one that looks quite similar called stipa tenuissima. Thanks, Kim! It’s interesting that you cut yours back–I haven’t seen that done successfully here, but if it’s working for you, that’s great. Is it why you’re not getting seedlings, that’s also possible, although the Feather Grass seeds out earlier in the growing season. You might experiment this next year and not cut one back and observe the results. Good luck! 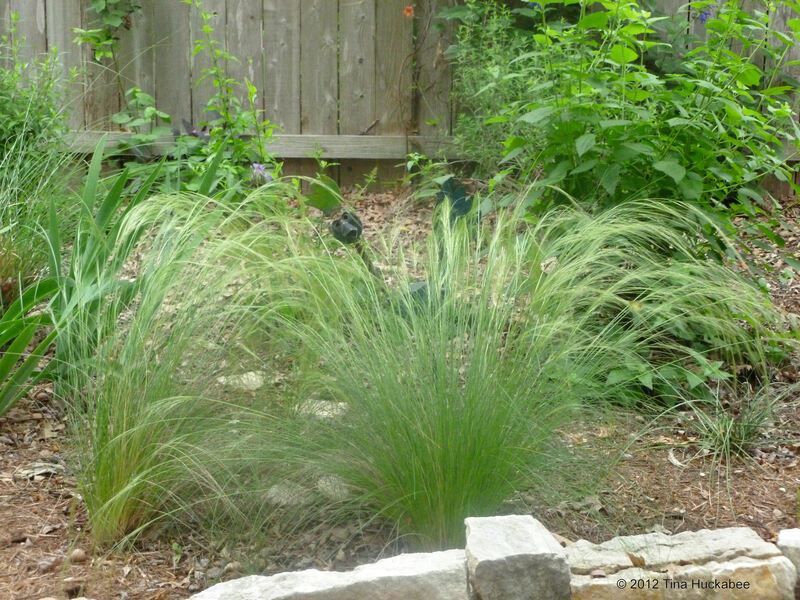 I love my Mexican feather grass that I had a landscaper plant for me. The problem is my dog urinated on two of my plants and the plant turned brown. Do I need to replace them. I was able to keep him off the other one and it is still green. Please help. Dogs!! Mine just dug a hole in a tidy gravel area. Not tidy now!! I’d suggest washing urine off of the plants (any plants) that Doggie urinates on, asap, and then give the feather grass some regular watering. Watch for a a few weeks, but if you don’t see any green emerge, the plants are done and you’ll need to replace. Feather grass is tough, I bet it’ll come back for you well.